The Vermont Senate Natural Resources and Energy Committee is demanding to know why Gov. Phil Scott's administration has missed deadlines and outright opposed planning efforts as the state works to meet federal water quality requirements. Committee chair Sen. Chris Bray (D-Addison) has called on Secretary of Administration Susanne Young to testify Thursday before his panel. The senator also sent a letter to Agency of Natural Resources Secretary Julie Moore asking for five months of the agency's records. The requests are part of the legislature’s efforts to spur the administration to lay the groundwork for new clean water efforts in Vermont. Bray also seeks answers about the administration’s outright opposition to even consider a plan for clean water funding. ANR has missed two legally required deadlines in the last several months. By November 2017, it was meant to have developed a long-term plan to collect money to pay for Vermont’s water quality efforts. By January, officials were to have finalized regulations for treatment of storm runoff from parking lots and other developments of three or more acres. Both the funding plan and the new regulations are part of a comprehensive policy package passed by the legislature in 2015, but federal regulators at the U.S. Environmental Protection Agency are watching, too. The EPA is monitoring Vermont's progress toward the requirements in a mandatory cleanup plan for Lake Champlain the feds approved in 2016. ANR still hasn't delivered a funding plan or the new runoff regulations. Moore has said repeatedly, and told Bray's committee last week, that she and the Scott administration are committed to clean water in Vermont, but have concerns about the state's approach to achieving its goals. Related Murky Waters: Who's Writing Vermont's Clean Water Regulations? Bray’s request comes less than a week after the Conservation Law Foundation, in testimony before the Senate panel, drew attention to the missed deadlines. 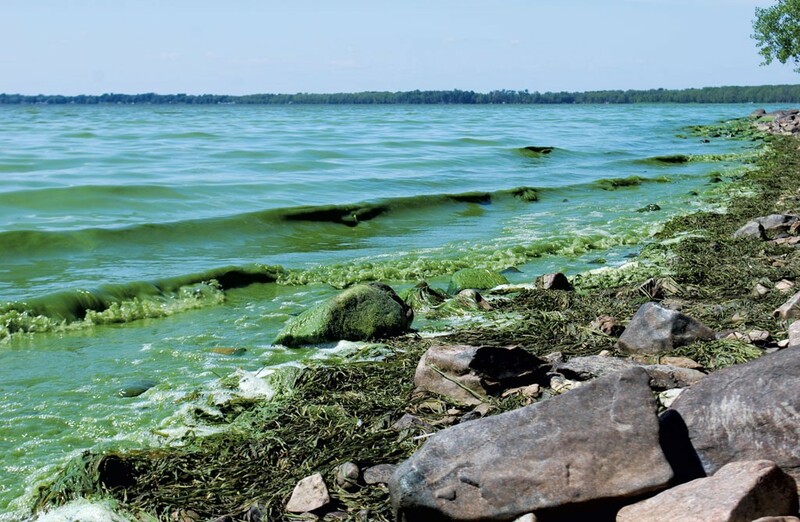 Rebekah Weber, the Lake Champlain lakekeeper for the environmental advocacy group, said Scott’s administration has missed at least four key water quality deadlines. In addition to the funding plan and runoff rules, ANR was late to issue regulations for municipal sewage treatment. An agreement between ANR and the Agency of Agriculture about water quality regulation was also eight months late, Weber said. “So in terms of missed deadlines, we are starting to see a very clear pattern,” she said in testimony March 29. Bray’s letter to Moore thanked her for speaking to his committee last week, and also posed a series of questions about the agency’s water quality work. He asked the secretary to provide the latest version of the runoff regulations that were due January 1. The agency has yet to release the draft for public comment, and has repeatedly refused to provide it to environmental groups, including the Conservation Law Foundation. The only publicly available draft is a version from October, which Seven Days published in February. “These questions could be answered if the committee had in its possession the most recent version of the rule or the standards proposed for inclusion in the rule,” Bray wrote. In an interview Wednesday, Bray said he sent the request to get a better understanding of the connection between the agency’s delay on the runoff regulation and H.576, a piece of legislation Moore asked for that would change the way ANR implements the rules. Moore said during last week’s hearings that the agency is unable to complete the overdue runoff regulations because the legislature is considering changes — which Moore proposed — to the law underlying the regulation. "I think that was a surprise to me and other committee members because … there’s nothing in 576 that’s essential to finishing the three-acre rule,” Bray said. Bray requested ANR provide the latest internal draft of the runoff rule, any proposed changes to that draft, and all correspondence within the agency, or with outside parties, about the draft rule. Bray also invited Young, the administration secretary, to testify before the Senate Natural Resources committee Thursday morning. The request came after Scott sent a letter March 20 announcing his opposition to a bill Bray introduced, S.260, that would require the administration and the legislature to each develop long-term funding plans for clean water. The bill would not give the state the power to collect those funds — that would require another piece of legislation next year. Minutes after the Senate unanimously approved Bray’s bill, Scott claimed that the bill would raise a new tax or fee on Vermonters. It would not. Neither the governor nor his staff has explained why he opposes the bill. Bray said he asked Young for an explanation in writing three times. “I thought, OK, if we can’t get a written explanation, let’s invite the secretary in person,” Bray said. In an email to Seven Days Wednesday evening, Young said the administration made a good-faith effort to work with the legislature when S.260 was in the Senate Agriculture Committee. "The administration provided technical and policy resources from several agencies and departments ... and it did so thoughtfully, professionally and thoroughly with the sole intent to move forward, not politicize, this important discussion," she wrote. Young said she was not planning to testify because the bill, passed on March 22, is under consideration in the House. The bill, she said, "is likely to change before it is next considered in the Senate. "Once the work of the House is finished, the administration will shift its limited resources and attention back to the Senate on what will likely be a bill that differs from the Senate-passed version," she said in her email. Correction, April 4, 2018: A previous version of this story misstated the number of deadlines missed by agencies during Gov. Phil Scott's tenure. The story also misstated Young's intention of testifying before the Senate Natural Resources Committee.